Model: Eco Drive. Dial Colour : White. Bracelet Colour: Silver Gold Two Tone. Tape Band: Bracelet links. Bracelet Material: Stainless Steel. Model: T33768881. Case material: Titanium. Strap type: Titanium. Dial colour: Silver, LCD. Case colour: Silver. Strap colour: Silver. Case depth approx: 13mm. Case Size: 43 mm. Case Material: Titanium. Water Resistance: 100m. Model number 355SSS1. A 2-year limited warranty is standard. Clasp Fold-Over Clasp with Safety. Band Material Stainless steel. Silver dot hour markers. Watch Details. Case material Stainless steel. Date window. Model Number: 26071IK. We deal in the finest high quality new and pre-owned watches made byA. Watch Details. Watch Features. Watch Item. Warranty: WT 12 Month Warranty. After receiving a quote, you will have a good idea of the trade-in credit you should expect to receive for your watch. AGE30TH JUNE 2017. WARRANTYUNTIL 30/06/2019. Series: Big Bang Tantalum Solid 18k Gold Limited Edition. Clasp Type : Solid 18k Gold Hublot Clasp. Calibre: Hublot Swiss made. The Hublot 18k Clasp is in a very nice condition, light scuffs. Case Material: Solid 18k Gold. Tissot T-Touch Expert T0914204705701. Model: T0914204705701. Series: T-Touch Expert. Case Material: Titanium. Case Size: 45mm. Case Thickness: 13mm. Dial Color: Black. Bracelet Color: Black. Part Number AR0399. ModelEmporio Armani Classic. Dial Color: White, Case Shape: Round. Band Color: Multi-Color, Band Material: Stainless Steel. Strap ColourDual Tone. Age GroupAdult. Strap TypeBracelet/Link Band. IWC Pilots Watch Double Chronograph Limited Edition Top Gun IW379901. Black Nylon strap. DISCONTINUED IN 2008 BY IWC. - Split-Second Chronograph Feature. - LIMITED TOP GUN EDITION. - Screw Down Crown & Caseback. This watch is backed by a two year warranty, which covers all parts except strap, crystal and battery. Watch Information. Dial window material type: Mineral. Water resistant depth:100 Feet. Dial color:white. Band: Original Panerai crocodile strap with Panerai titanium buckle. Case Size: 47mm. We deal in the finest high quality new and pre-owned watches made byA. Bezel: Titanium. Watch Details. Watch Features. GRAHAM Chronofighter. Oversize Airwing. Strap - GRAHAM black silicone with buckle. Case - Brushed Titanium. Crown - Titanium. To help guard against stolen credit cards and identity theft, NO exceptions will be made. · Inner and Outer Official Panerai Boxes. Case Material: Titanium. Water Resistance: 300 m. Fastening: Pin Buckle. Bracelet Material: Rubber. ZENITH Pilot Montre d’Aeronef. Strap - ZENITH brown leather with buckle. Type 20 GMT. Dial - Black Baton. Reference - 96.2431.693/21. We rate the condition of our watches on a scale of 5. Case Thicknes - 12.5 MM. Includes chronograph for lap timing. Unworn with Box and Papers. Case Material: Black Titanium and Stainless Steel. Case Size: 45mm. Water Resistance: 100m. Bracelet Material: Black Rubber. 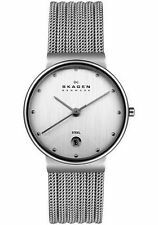 Skagen watches represent the technical excellence, refined design and operational simplicity that have created the unique reputation of Danish design. About Skagen. The fishing village of Skagen--the Skaw--lies where the northern-most tip of the Danish peninsula known as Jutland bends East and breaks the surging waters of the Kattegat and Skagerak seas. The DC2 is the fine example of the classic and sporty design of Tonino Lamborghini. The DC2 has a stainless case and Titanium band. Excellent Tonino Lamborghini DC2 55.10 Carbon Black’ Chronograph Titanium Watch, in good working condition. · Inner and Outer Official Panerai Boxes. Case Size: 44 mm. Case Material: Titanium. Water Resistance: 300 m. Fastening: Pin Buckle. Bracelet Material: Leather. Philip Persio Mens' Watch Case width approx: 40mm Case depth approx: 11mm Dial colour: Black Case colour: Grey Case material: Metal Strap type: Metal Strap colour: Grey Water resistant: Yes Clasp type: Fold over clasp (with safety) Movement: Quartz (battery) Note: Would suit a wrist size equal and below 6.5 inches or 16.5 cm. Source: Genuine. Returns accepted. 'Best offers' are usually answered within 30 mins. You are invited to contact me to require further information or additional pictures. CLEARANCE SALE NOW ON! Black Dial. 100M Water Resistant. Hublot Big Bang Unico Carbon 45 mm 411. RX - Unworn with Box and Papers. · Official Hublot Box. · Official Hublot Manafacturers Worldwide Warranty. Case Material: Carbon Fiber. Case Size: 45 mm. · International Warranty Card. As the inventor of the quartz watch in 1969, Seiko has led the watch industry for four decades in refining quartz technology for each new generation. SEIKO Solar is a bright idea that is good for the planet. Watcheslimited presents this trendy Skagen watch. Range : Hagen. Dial Colour : White. Clasp : Buckle. Strap Colour : Black. Watch Included. Strap Type : Strap. Band Length (cm) : 20.5. Nuova inserzioneMen's constant Moon Orologio, giorno, data, secondi centro Nuova Batteria v.g.w.c. This is in perfect working order. This has a stunning chrono style dial with gold hands. This is in lightly used condition. Dial is in mint condition with no scratches. Gents Constant TL278 Multifuction Moon / Sun Quartz Dress Watch. Limited Edition Wyler Geneve Code R Incaflex Titanium Chronograph. chrono sub-dial at 9 o'clock and 12hrs. chrono sub-dial at 6 o'clock. Case Size: 43.5 mm. Case Material: Titanium. · Instruction Booklet. · International Warranty Card. Water Resistance: 600m. Citizen EW2410-54A is an incredible attractive Ladies watch. Case material is Titanium while the dial colour is Off white. The features of the watch include (among others) a date function. This makes it suitable for swimming, but not high impact water sports. Water Resistance: 100m. Case Size: 41mm. Case Material: Stainless Steel. Bracelet Material: Stainless Steel. Model Number: IW372503. Crystal: IWC Scratch Resistant Sapphire. Band: IWC Titanium Bracelet. We deal in the finest high quality new and pre-owned watches made byA. Case Size: 42mm. Bezel: Titanium. Watch Details. Stainless Steel Breitling Avenger Seawolf A17330 - Grey Dial - 45mm Case Size - Box & Paperwork - 2014. New large titanium case with mineral glasses. CORUM Admiral’s Cup Competition Black Flag. Strap - CORUM black silicone strap with buckle. Case - Black Titanium. Case Thicknes - 15 MM. Dial - Black Guilloche. To help guard against stolen credit cards and identity theft, NO exceptions will be made. Reference - WAR101A. Crystal - Sapphire anti reflection coated. We rate the condition of our watches on a scale of 5. To help guard against stolen credit cards and identity theft, NO exceptions will be made. Hublot Classic Fusion Blue Titanium Chronograph 521. LR - Unworn With B P. Official Hublot Box. Official Hublot Manufacturers Worldwide Warranty. The watch also features a blue dial with steel detailing beneath sapphire glass with anti-reflective technology and a matching carbon fibre bezel. SEIKO Solar is a bright idea that is good for the planet. As the inventor of the quartz watch in 1969, Seiko has led the watch industry for four decades in refining quartz technology for each new generation. Model number: 233LTTM. Large titanium case with charcoal grey dial. Dial color: Charcoal Grey. Bezel material: Titanium. Clasp: fold-over-clasp-with-safety. Watch Information. Band material: stainless-steel. The perfect balance of beauty and value. Case material:titanium. Bezel material:titanium. Watch Information. 12 & 24 hour markers. Second hand and date function. Water resistant:100 feet. FANTASTIC WATCH FROM CITIZEN. COMPRISES OF, BLACK DIAL, DATE AND ALL TITANIUM CASE AND BRACELET WITH QUICK RELEASE.